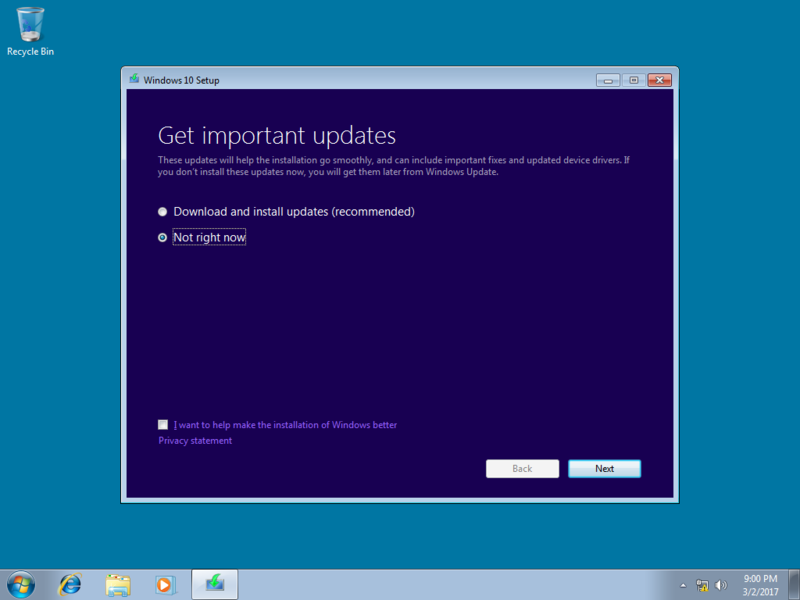 and you will be ready to restart and set your bios to UEFI support and finishing booting to your new uefi partition! My name is Jason. I've been in IT for 30 years and usually just lurk around. I had grown tired of the drama on many of the other boards, so after a hiatus, I went looking for a new place to hang out. Found this. I like it. I run an all purpose IT shop for companies with between 25 and 250 employees/workstations. I am addicted to television, and I get the biggest kick from watching my kids grow up. Good food and international travel is also high on our list. I hope to have a chance to participate in some of your topics here. At the request of another user, I'm going to try this again. With a couple of pre-discussion statements. We have been doing TS for decades. We have been VMimg Servers for years. We are now beginning to move TS customers to Windows 10 Pro hosted by Hyper-V. This question has nothing to do with the design or deployment of a VDI solution. When you deliver a physical demo of VDI to your customer or potential customer, who has absolutely no idea what the words Virtual, VDI, VM, Hyper-V, ESX, VMware, or any other word you are thinking of right now, mean..... What is your model? What is your existing physical on site demo unit look like? What does it connect to? The physical onsite demo for the customer cannot be a PC or anything that any normal end user would think is a pc. It cannot be a laptop, or chrome book, or tablet, or ipad. It must support 2 or more 23" LCD displays. It must support a local printer, a local barcode reader, a local Driver License reader/scanner, a local utility meter reader, and an electronic signature pad. The physical onsite demo for the customer must connect to local LAN resources for proof of concept. In the final solution, there will NEVER be a cloud based solution for the customer, all connections and data must remain on site. I don't give two hoots about your ideas on how to design or deploy a VM or VDI (call it whatever you like) environment. I only care about what you carry into a customer site to provide a demo of what will be at the users desk after their current PC goes in the dumpster. You see, if you don't carry hardware into the customer site and set it up to show them, (because they have no idea what you are talking about), you may not have anything to add here...... and that's okay. I am looking forward to comments from folks who provide this kind of a demo for their customers. Good job at troubleshooting. I'm wondering what led you down this path versus something related to Networking, hard drives or software drivers? Remembered it from several years ago with another SQL based application. Don't know what made me think of it at 1:30am. But I'm ok with it! Well, I'll be dipped. After installing KB4482887, and running these two commands on the server: "Enable-PSRemoting" and "Enable-WSManCredSSP -Role server"; I came back to Hyper-V Manager and BAM! connected right up! We recently picked up a new customer because the users couldn't log in each morning until they had walked over to the server and logged in to the desktop. We came in because the old company couldn't fix it. We found AVAST installed on the server and AVAST is known for preventing services from starting before certain conditions are met. @hari We have many customers like this. A few are using G-Suite (that way before we took over). I have to say, the new G-Suite sync tool, totally eliminates and problems I had years ago between Google apps e-mail and Outlook. I actually like it now. E-Mail and Calendars are seamless. In an office like this, my baseline would be a 24 or 25u cabinet on casters with a Dell R540 beefed up and running Hyper-V with the Domain Controller in a VM, and Application server in another VM (like Timeslips, QuickBooks, etc) and another R540 for the DB application and SQL. (ie; Summation by AccessData) I would split the DB server if volume were expected to warrant it. I have no interest in managing SharePoint (too many headaches from 15 years ago) So I recommend Hosted SharePoint with AD integration. We use ClouberryLab or BckupAssist to backup to local media (Synology NAS RAID10 - RS2418RP+) AND S3 with full encryption, then we use Cross Region Replication with versioning for fail safe. As for the server, once you get to the bigger R series of the Dell servers, it really comes down to drive bay capacity. Just make sure you can accommodate additional drives in RAID 10 if your capacity needs increase. I hope this get your mind moving in the right direction. Please ask for details if you need anything more. LOL, we thought that you were really into Go or something. I need some help sorting out the exchange connectors on a server. We were called in to figure out a spam problem. It's not severe and during our exam, we are trying to check the configuration of Exchange and get mail test tools to be happy. Right now we are getting: Reverse DNS does not match SMTP Banner from mxtoolbox. This is a simple MS Exchange setup; One Exchange server on a domain, people connecting with MS outlook from inside the building on the domain and from outside the building using Ms Outlook, and two copiers that can send e-mail. The issue is all the receive connectors. It's not clear to me which one mxtoolbox is seeing. I have a small office that has a single server. It has Windows Server 2016 STD installed (full GUI) and has Hyper V enabled. MS SQL 2014 Standard in installed on the physical server along with some Windows 10 Ent VMs. I have our application installed on server and also on the VMs. The SQL efforts of the VMs are slower than on the Server OS. I've had chats with the developers, and they suggest the SQL server and application are all optimized. Leaving me with SQL Query issues in and out of the VMs. I am looking for some advice on how to troubleshoot this and some suggestions on things I can do to try and get better speed for the end users. I won't know definitively until mid morning, but I think I sorted it out. It was the Distributed Transaction Coordinator in the Windows 10 VDI firewall. I allowed it for the domain profile and now the queries are running faster than I can witness. From 15-16 seconds....to under one second. Holy crap! I'll report back in a few hours. There is a guide here by Timothy Gruber which appears to do what you want. Don't forget the sales tax, gas tax, airport tax, and hotel tax, etc... you probably pay quite often. It all adds up. Americans pay a lot more tax than they think they do. I started with one of his builds, then as I became more familiar and comfortable, I started building them myself on Hyper-V. Now I have a couple on AWS LightSail. I don't use Nextcloud for too much, it's mostly for my pics, notes, and bookmarks. RE: How do YOU demo VDI? I'm on to other things now. This one seemingly simple and casual question has resulted in a rise in blood pressure and anxiety that I find completely unnecessary and unproductive. I have found no helpful or beneficial responses so far here. Only argumentative replies suggesting I have already pigeon-holed my demo tactic and that I chose wrong. We use ConnectWise Control (formerly ScreenConnect [SC]). Honestly, I would be hard pressed to give any other option a second look. BUT, it didn't start out that way. In the product's infancy, and early in our learning curve, we only used its basic functions (which every other products offers too). But as we mastered it; and it became a more complex and flexible product, we have turned it into a be-all/end-all for RMM. The things we can do through SC would amaze you. Granted most of it is OS related, so it's not something SC magically provides, but the fact you can to it without ever seeing or connecting to the gui at the other end make it extremely valuable. Are you using hosted or on-premises? Windows or Linux? Windows runs better with lots of resources, Linux runs way better for us in cloud on a "per dollar" basis. Windows. Runs great. About 3500 Clients in Access Mode. Just curious what you are doing to recover from a complete failure and breakdown of Nextcloud. My NC is using S3 storage and is Cross Region Replicated with Revisions. As well as duplicated via a Desktop client with full sync. What do you do to safeguard your data in NC? Based on a comment in another thread I decided to take a look at MS Hyper-V Server 2016. Simple to install. I LOVE the feel of it at the console and through RDP. It takes me back to my Dos and Unix days. Plus, It's almost identical to ScreenConnect Backstage, which is my new favorite place to work. However........ After a whole week, I still cannot mange it from my workstation. I have everything except one piece set properly, based on hours and hours of reading and trying. Is it even possible to manage a workgroup Hyper-V Server from a Domain PC through Hyper-V Manager? An error occurred while attempting to connect to server. "R510-Hyperv". Check that the Virtual Machine Management service is running and that you are authorized to connect to the server. That's cool, look what a bunch of hyphens did! Virtual Machine Management services is running. I can successfully map a drive to it with Net Use, I can successfully RDP to it, I can ping it by name...... I just can't get Hyper-V Manager to connect to it. Any ideas? Anyone been here before? Yeah, given that you are not in production yet. More stable, faster, more modern. In Volume License Center? We have it in production, so it is definitely available. Eval Center. I'll try VLC now. Well - apparently Hyper-V 2019 has had an issue where RDS doesn't work. That's some serious fail right there. There are many operating systems out there. Do any of you use any that are not-so-familiar for anything other than productivity for work or home? I was doing some reading today and thought I install a few to what they were like. Last week Microsoft announced they will start nagging end users to upgrade to Windows 10. The nagging will start April 2019. This created a need to be able to discuss, on the fly, which PCs at the customer are on Windows 7. I created this Accesslist Expression to show me the customer's Windows 7 PCs super quick. I hope you find it useful, or it gives you ideas of your own.